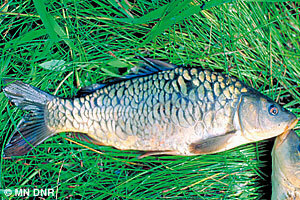 Species and Origin: The common carp is a large omnivorous fish. They have large scales, a long dorsal fin base, and two pairs of long barbels (whiskers) in its upper jaw. Native to Europe and Asia, it was intentionally introduced into Midwest waters as a game fish in the 1880s. Status: They are established in 48 states. They are distributed in hundreds of waters in the southern two-thirds, and a few waters in the northern third of Minnesota. See US map . 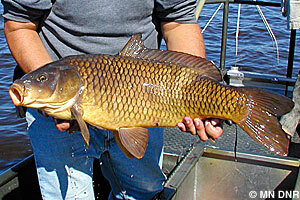 Means of spread: The incidental inclusion and later release of live bait spreads common carp. Where to look: They live in lakes, rivers, and wetlands and are often seen in spring when they spawn in shallow waters. Regulatory Classification: It is a regulated invasive species (DNR), which means introduction into the wild is prohibited. Fish caught while angling may be returned to the same water body.